diB insurance is a highly professional new company with deep roots and a fine lineage. The experienced management team can claim to be successful in virtually every area of insurance and has an outstanding reputation for innovation and integrity. The company was formed in 2011 by combining the dynamic management of a well-established, successful commercial insurance operation with another specialising in product development and legal services. 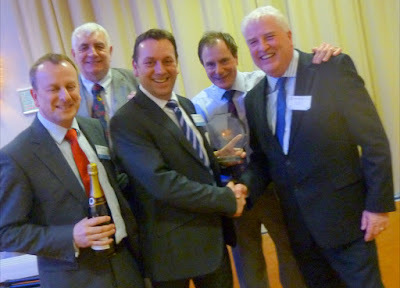 Winners photo, from left to right: Adrian Kinder, Randolph Murray, Kevin Kinder and Brian Dunk with Westinsure Managing Director - Norrie Erwin. diB insurance Ltd is an authorised and regulated insurance intermediary - FCA 314116. Our sister company Straight Solutions Ltd is independently authorised by the FCA 315448. With more than a decade of experience in all areas of general insurance Adrian has a strong focus on customer service and business development with a personal touch. With a natural way with clients and deep routes in the local community he is very familiar with local issues and the needs of the area. He is also a bit too good at squash to take on if you only play occasionally, having captained his club, Marlborough in county level competition. Kevin joined the family business – then called Devizes Insurance Brokers straight from school and has a working lifetime of experience to offer our clients. He specialises in advising both private and business clients on their needs and, when he is not actually working – very few people go as many extra miles for their clients – he is an active tennis player and music lover. Brian holds the highest professional qualifications in marketing and insurance and has a proven track record of success, featuring at the heart of three major industry awards for DAS, Greystoke Legal Services and Hanover Park Group. Formerly the founding Head of Commercial Marketing with Norwich Union and a Regional Manager, Brian entered the legal insurance sector in 1996 with Greystoke Legal Services and quickly helped to turn this company into the market leader for the emergent litigation insurance market. He joined DAS in 2002 to run its subsidiary ATE insurance division '80e' which grew by 300% in the next 4 years. In 2005 Brian was invited to represent the industry position to HMG's Civil Justice Council. A well-known figure on the solicitor lecture circuit, Brian has an almost unsurpassed width of knowledge on the issues facing the legal profession and UK insurance broker market. Brian's own company 'Straight Solutions' was integrated into diB insurance in 2011. Randolph has had a very successful insurance career starting with Eagle Star and through promotion went to become managing director of Wren Insurance before founding Vision Underwriting, now part of Liberty International. He has always operated on the leading edge of product innovation with a legal emphasis and is hugely respected for his knowledge and integrity throughout the insurance world. Private clients who value the personal touch and are confused by the plethora of Internet offerings can let our fingers do the walking for them. Just follow our Private client link. Business clients who want to speak to like-minded professionals, people who understand the difference between an asset and a liability and who can also differentiate a web cam from a cam-shaft should contact one of our business advisors via the Business Insurance page. © Copyright diB Insurance 2011.